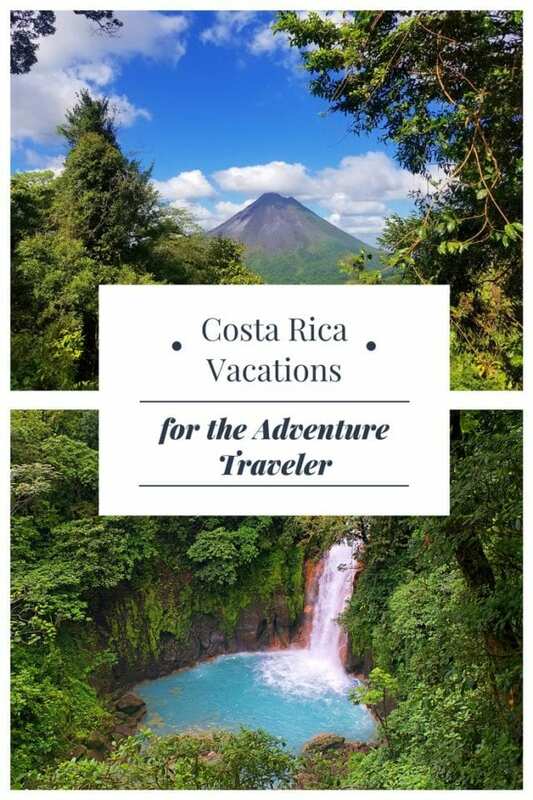 Costa Rica vacations cater to every taste and every traveler. Who wouldn’t enjoy a little slice of Pura Vida? Almost every trip begins in San Jose, but after that, you choose your own adventure. From surfing in Tamarindo to all-inclusive resorts in Jaco to the beaches and jungles of Manuel Antonio, there is a call to the warm waters of the tropics like a siren that lures sailors to the sea. Would you believe us if we told you to shun that siren and head for the mountains? 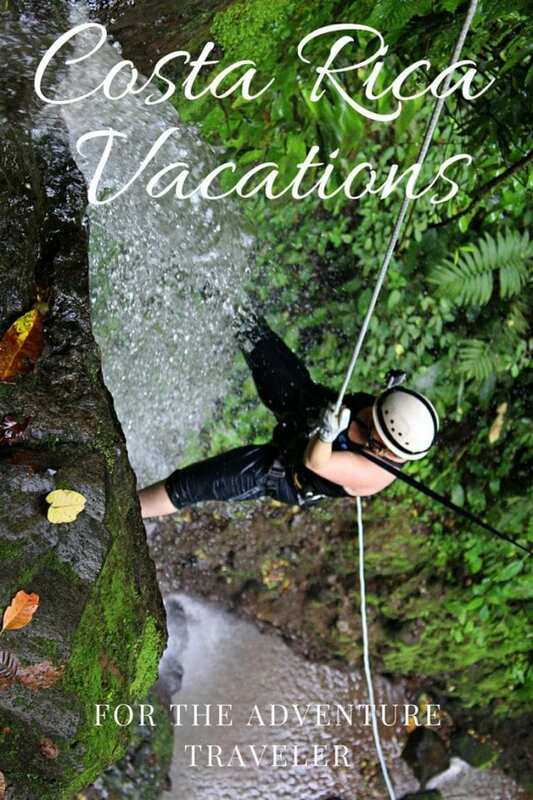 There you will find Costa Rica vacations that will tantalize your sense of adventure. San Jose Airport is the hub of transportation to Costa Rica. Flights come in from all over the world at all hours of the day (and night). If you’re coming in at night, there are plenty of places to stay near the airport. It’s also possible to arrive mid-morning and make the 3-hour trek to Fortuna by private car. 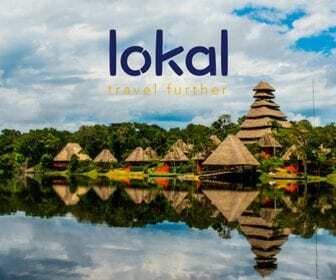 Additional renter’s insurance is required for car rentals in Costa Rica and there is a hefty premium for renting cars at the airport. Costs can be reduced if you spend the night and then rent a car the next day. We chose to package transportation into our excursions and not rent a car in county. 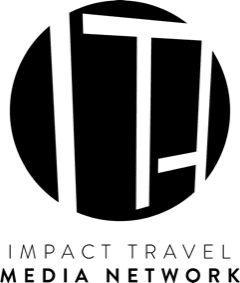 There are plenty of hotels and hostels in La Fortuna and the surrounding area from jungle eco-lodges, to hot spring resorts, to hotels and budget hostels inside of La Fortuna itself. Each of these accommodations offers something a little different. Ecolodges offer exposure to the magnificent jungles of Costa Rica. The resorts offer top-end amenities and access to the hot springs on property. Staying in La Fortuna allows you to explore the shops and culture of the town while negotiating for discount activities from a large selection of providers while in country. You can often find great deals because the providers know that you can just walk next door if they don’t offer a competitive price. 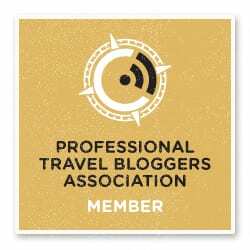 We chose to stay at an eco-lodge and leverage group travel for massive savings. 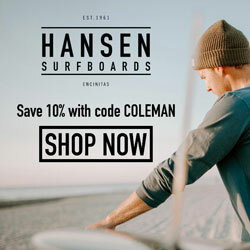 How massive of savings? 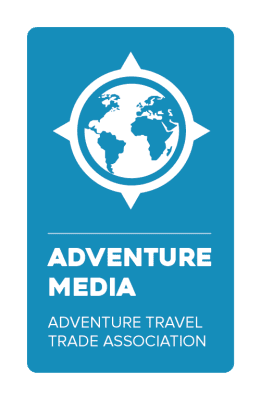 We were able to do all of these adventures with meals, activities, 7 nights lodging, and transportation included for $900 / person. That’s an all inclusive price, not including airfare. Lost Canyon is a canyon just outside of Fortuna. A short ride will take you to the Ops Center where you get your gear and then continue up the hill to the top of the canyon. After a short safety introduction and hike to the canyon, it’s on. 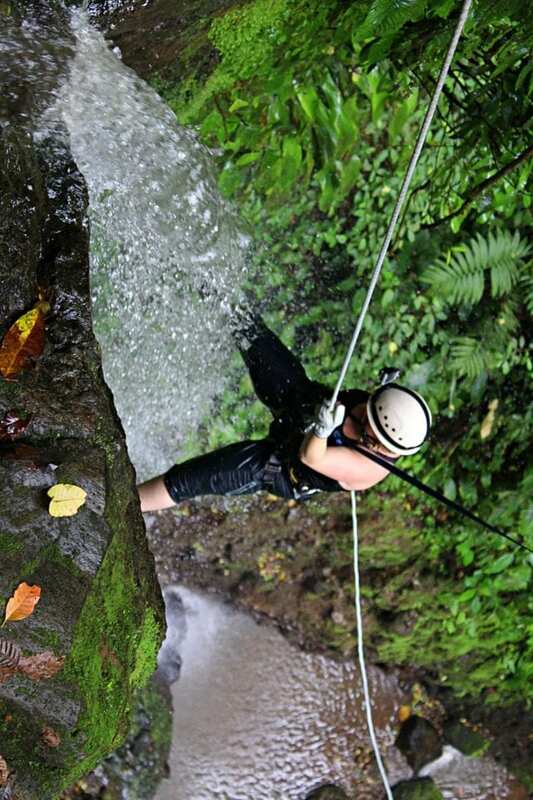 Two things about this adventure- you will get wet and you will be on rope. There is enough redundancy in the system that the guides can fully control your descent if needed or desired. You get in the canyon right away with the instruction that you should walk in the water and not try to balance on the slippery rocks sticking out of the stream. Accept and enjoy the water. Some people in our group brought a 1mm neoprene shirt, but that is in no way required equipment. It’s a great introduction to canyoneering where you get to play on rope and in the water. It’s also a beautiful nature hike through the jungles of Costa Rica. 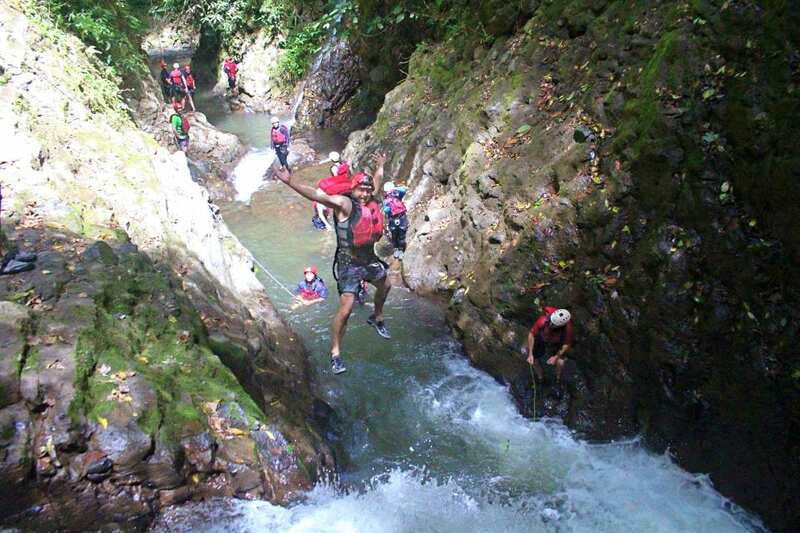 You travel down-canyon hiking, rappelling, and with the occasional rappel to zip combo back towards the Ops Center. There, you can shower off, change into dry clothes, and eat a delicious lunch surrounded by nature. There is usually a sloth hanging out in the trees around there too. 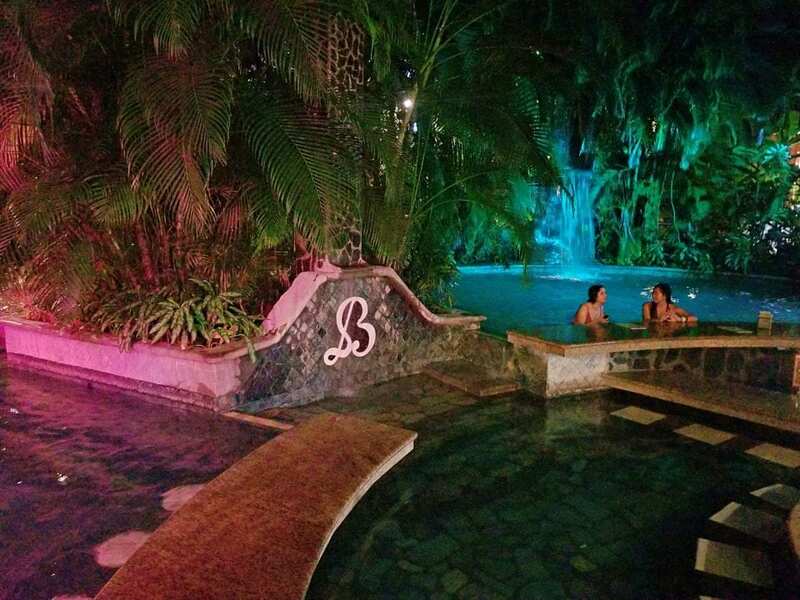 The advertisements claim Baldi Hot Springs is the world’s largest Hot Springs. New Zealand, Dominica, and Yellowstone might object to that title but there is no denying that it’s huge. Hot water flows down from the Arenal Volcano and is directed into 25 different pools. From steaming hot waterfalls to warm, swim up pools there is something for everybody here. There is even a full up waterpark and waterslide section for the kids. Be warned, the slides at the top of the complex caused more little bumps and bruises than the rest of the trip combined. You can choose to seek out more adrenaline or simply soak away the stress of travel. Our four-hour block includes a buffet-style dinner of both local and international cuisines. We choose to come in the evening to soak in this mineralized water as the sunset and pool lights come on to paint the sky and rocks. This timing was further optimized by the opportunity for a big eat up at the large buffet. This isn’t a secluded hippy hole by any stretch of the imagination. It’s a full-on spa, water park, bar, and buffet rolled into one steamy hot attraction. Venado translates to deer in English. 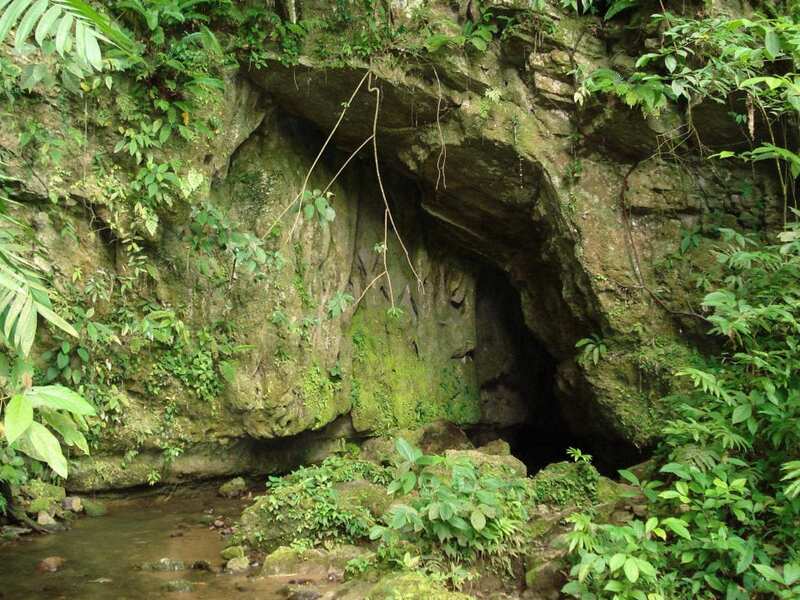 This cave was found in 1945 by Lael Herrera when he followed a deer into the entrance. The French explorer Robert Vergenes made the first scientific exploration of the cave, but he only documented the first 350 meters. In 1969, the full length of 2,700 meters was documented and explored. I have done some hard-core caving expeditions before, but I was surprised by how adventurous this commercial cave tour was. You crawled through tight passages, walked under waterfalls, and tromped through underwater springs. The cave decorations are pretty good, but the adventure is undeniable. There was even an option tight squeeze/climb section at the end that only half our party elected to do. Definitely make sure you pack your knee pads for this one. There are two criteria I use to judge ziplines, the view, and the rush. 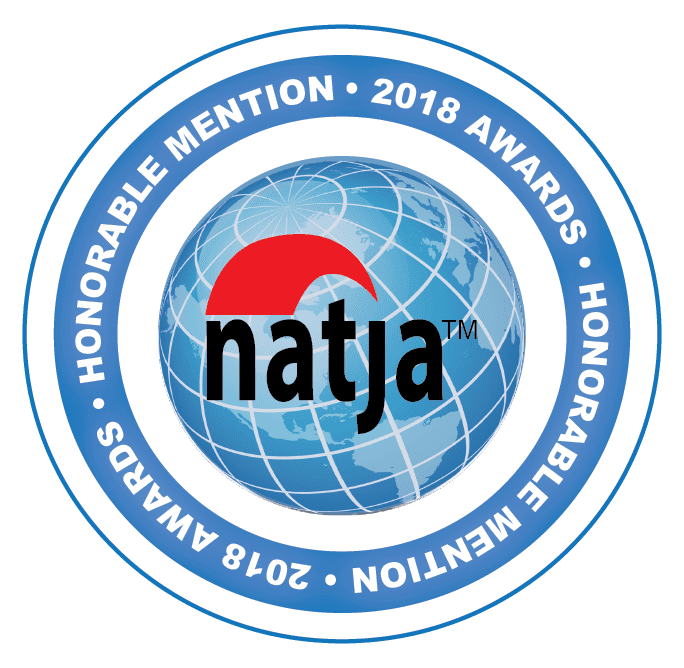 Sky Adventures ranked a 10/10 on both. You know that you’re in for something special as you travel towards Arenal Volcano. Each turn reveals a new view of the peak that tickles your imagination. Finally, our bus climbed up to Sky Adventure’s base operations. 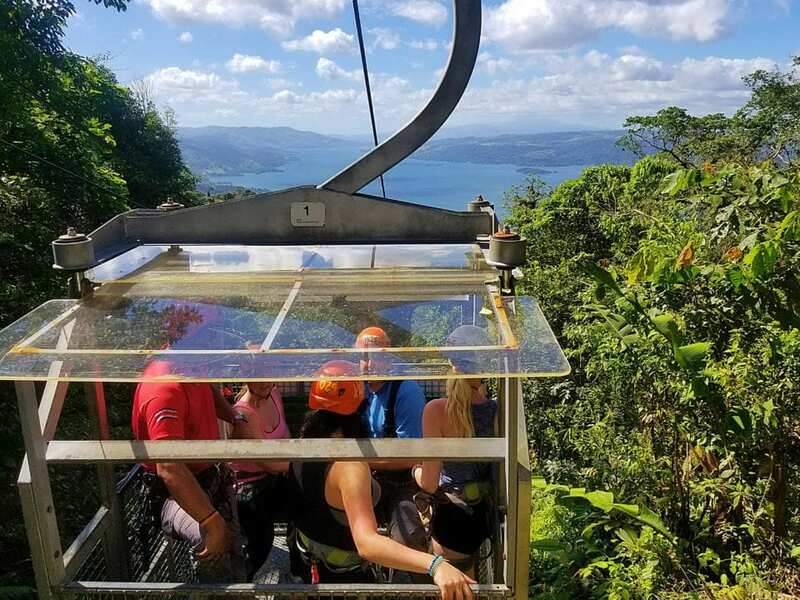 I rushed to their observation deck to catch an amazing view of the cinder cone and the looked around to see Lake Arenal shimmering down on the valley floor below. I wondered what they could do to top this view and I soon found out. We took the sky tram 750’ up the mountain and covered nearly ¾ of a mile linear distance on our way to the top. After one practice run, we started our first zip. 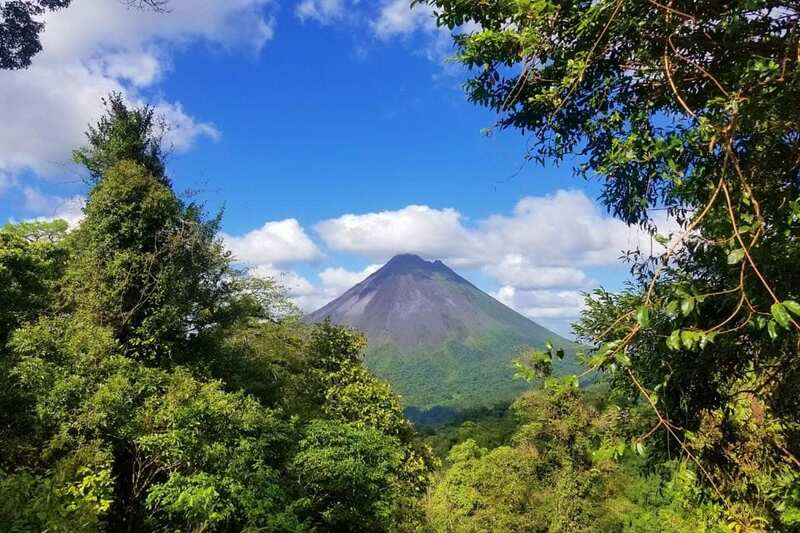 The first thing you noticed was the amazing view of Arenal from the zip platform. The next thing you noticed is that you were zipping over a canyon that was nearly 650’ below you. This is the highest zipline in all of Costa Rica. 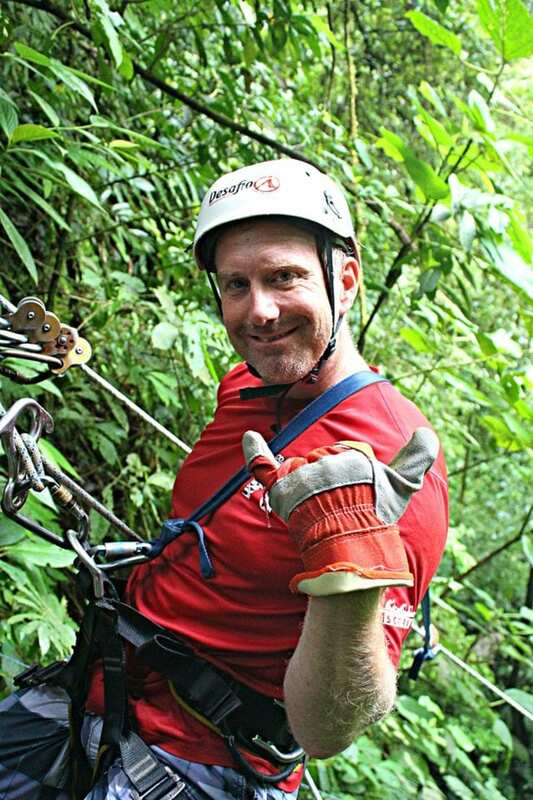 We also experienced one of the fastest ziplines in Costa Rica before we reached the bottom 8 zips later. It stretched 2493’ feet but still took nearly a minute to cross. You had plenty of time to hear the whizzing of your gear, feel the wind blowing in your face, and admire the beauty of Lake Arenal in front of you. 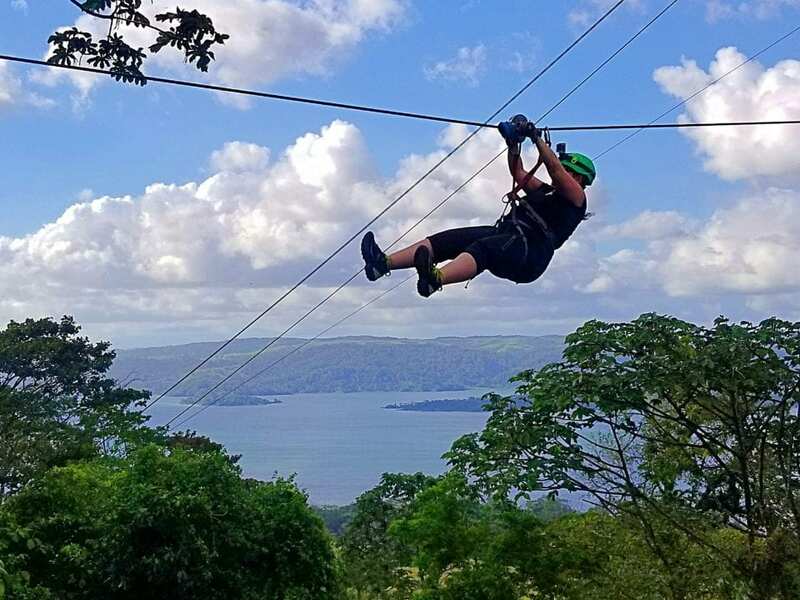 A lot of people thought that the ziplining adventure was the highlight of their Costa Rica vacation. 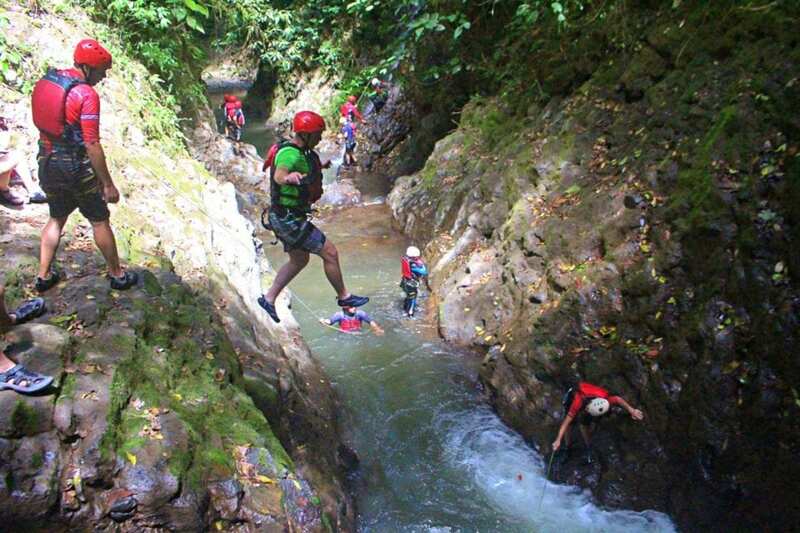 Gravity Falls is known as the most extreme adventure in Costa Rica for good reason. Your day starts with a 150’ rappel and ends with a 40’ jump off a cliff. We had quite a few people opt out of this one completely and about a 1/3 of the people who went chose not to make the jump. Everybody who went enjoyed it immensely. The opening rappel was everything you could want a rappel to be. It was high, but with the fulcrum set out far enough, you could easily weight to rope. You bounce down the cliff alongside a pumping waterfall until you hear your bottom belayer yell “let GO!”. 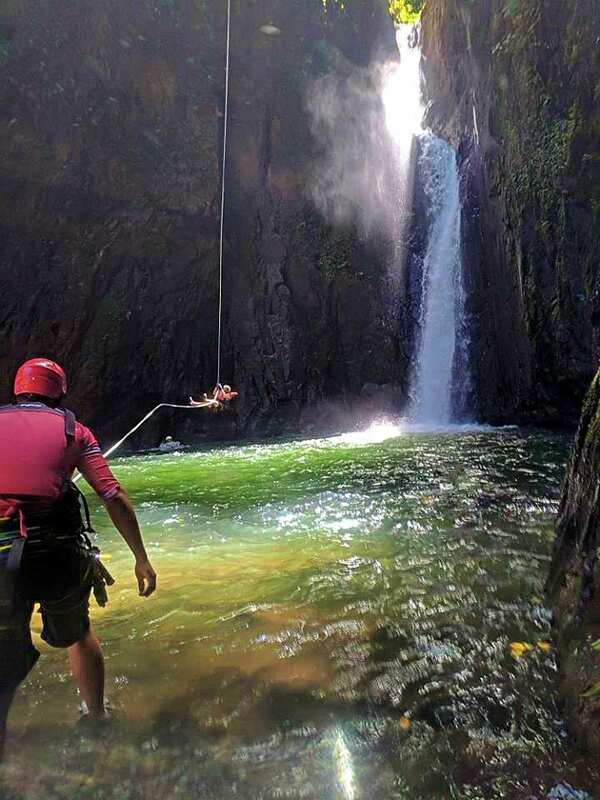 The bottom belayer pulls you away from the base of the falls and drops you into the clear water of the pool. The canyon continued in this fashion. You make a really short hike to an obstacle then you jump, swing, climb, or rappel to get around it then it usually ends in a splash. Every jump, even the big daddy at the end was optional getting wet is not. Jenn chose to swim the canyon as her FOMO was too strong to miss it, but her desire to protect her artificial knees precluded her from jumping. I’ll admit I was more than a little intimidated by the 40’ jump at the end. I made a point to look straightforward and just walk the plank over the edge. I heard it helps your body alignment but more than that, I didn’t want to linger on the edge and lose my courage. This jump was the single biggest adrenaline rush for me on my vacation. Gravity Falls and Lost Canyon both offered different flavors of adventures. We discuss each trip in greater in our post Gravity Falls or Lost Canyon: which is better? We came back to the lodge after Gravity Falls with enough time to plan another trip. 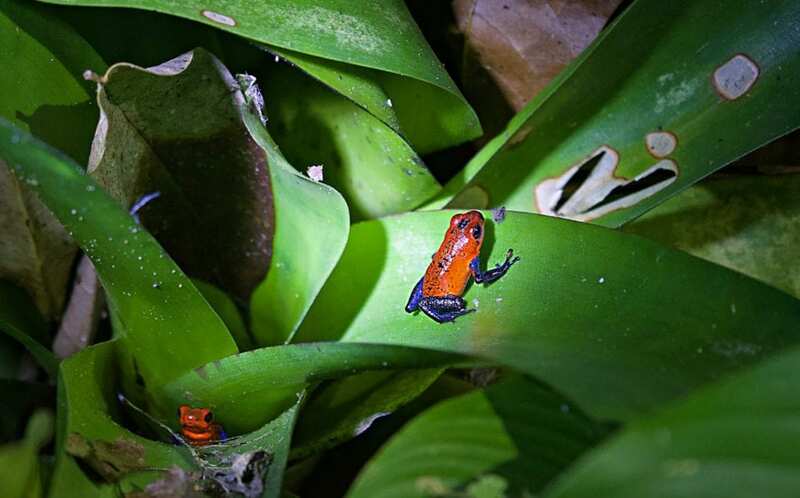 We chose Ecocentro Danaus for the express purpose of seeing frogs, and we were not disappointed. 60% of Costa Rican wildlife is nocturnal, so the forest came to life around us as the sun dipped below the horizon. We saw frogs, sloths, birds, butterflies, alligators, lizards, and agoutis on our hour and a half walk around the 10-acre property. 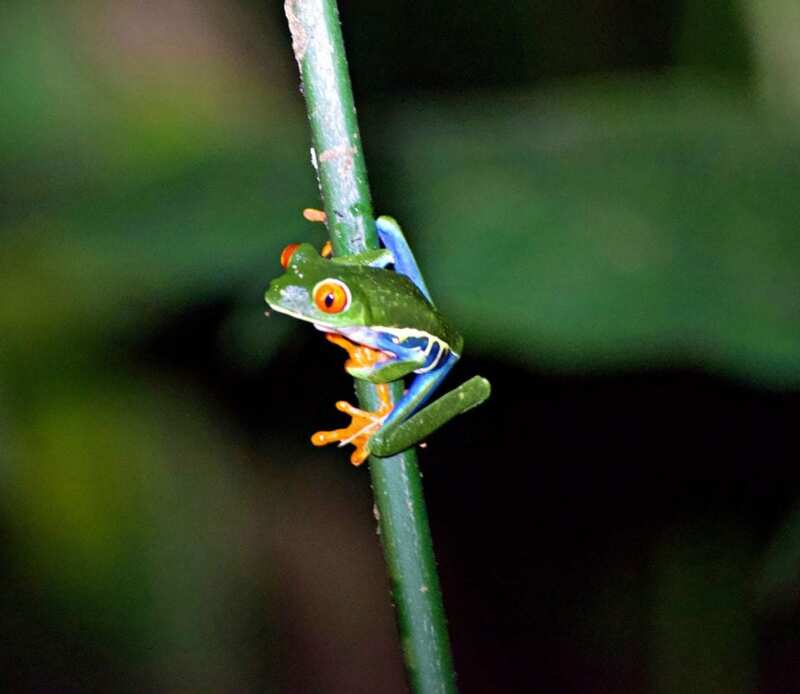 Night hiking is a great way to explore the real night life of Costa Rica and a great addition to any Costa Rica vacation. Pro-Tip: Be sure to not only wear long pants and closed toed shoes while adventuring in the jungle at night, but also be sure to give yourself a hearty coating of insect spray before setting out. Way more than 60% of the Costa Rican mosquitos are out at dusk. 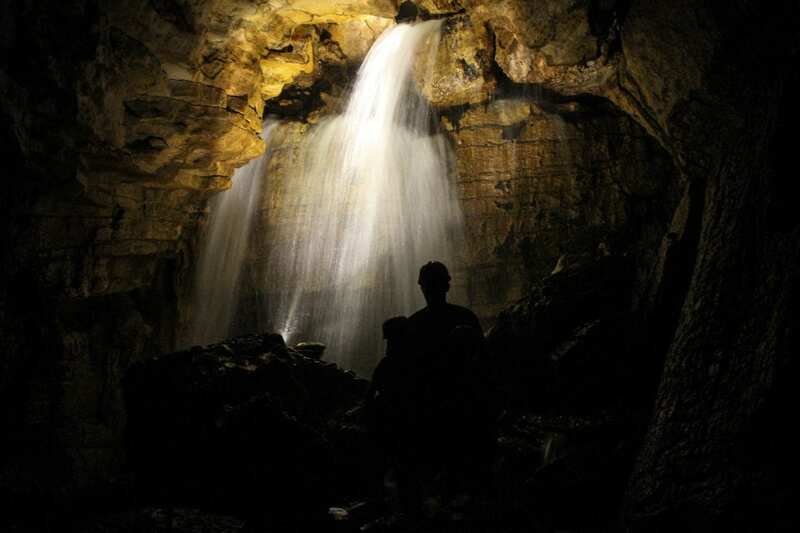 You should also pack a high-powered flashlight for the caves and night hiking and make sure you bring it on your walk. The flashlights they provide are decent but you can bring much better ones from home. 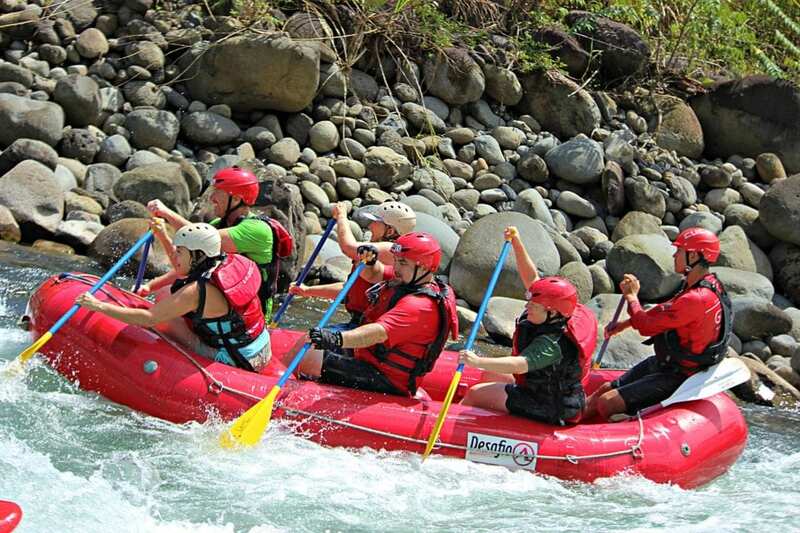 The Sarapiqui River sports exhilarating class III-IV rapids. What’s does that mean? Class IV rapids are defined as “Intense, powerful but predictable rapids requiring precise boat handling in turbulent water. Depending on the character of the river, it may feature large, unavoidable waves and holes or constricted passages demanding fast maneuvers under pressure.” Does this apply to the Sarapiqui? – Absolutely! Two of our boats flipped completely in the first rapid and a couple more people were ejected from the raft they were in. 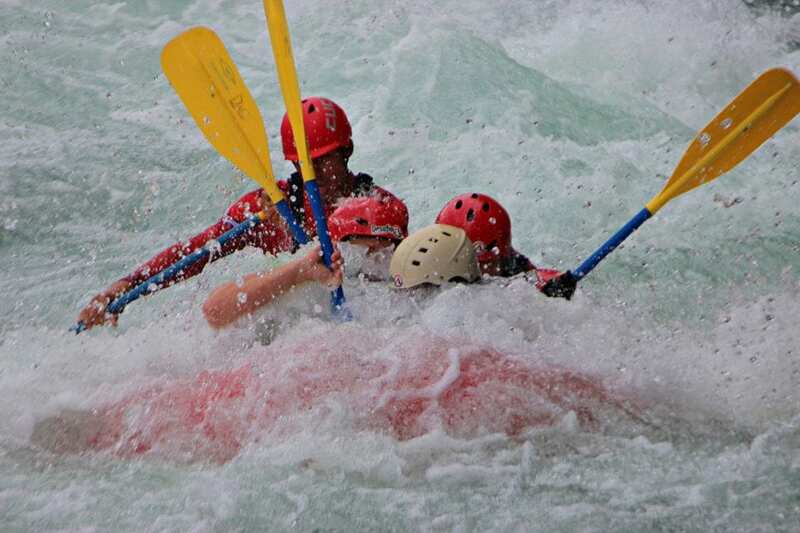 By the time we reached the second rapid, we all learned to lock in our feet and do exactly what the guide said. When he said paddle – we paddled. There were a couple of holes in the river that were unavoidable. Our group photographers set up station there for some great action shots. We were all feeling proud of ourselves for a great job running the river. There were zero flips and zero swimmers from our boat. It wasn’t until we reviewed the footage that we realized how close we came to swimming. There weren’t any flat sections, but there were a couple of times that we could look around and enjoy the jungle around us. 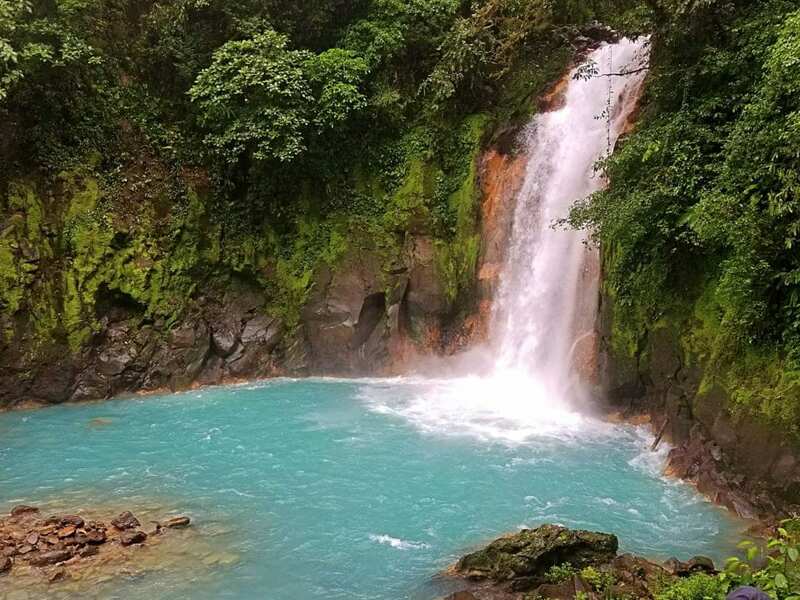 Rio Celeste is an insanely blue river and waterfall, much like Havasu Falls in Arizona. There are even more similarities as it’s a sacred place for the indigenous people. 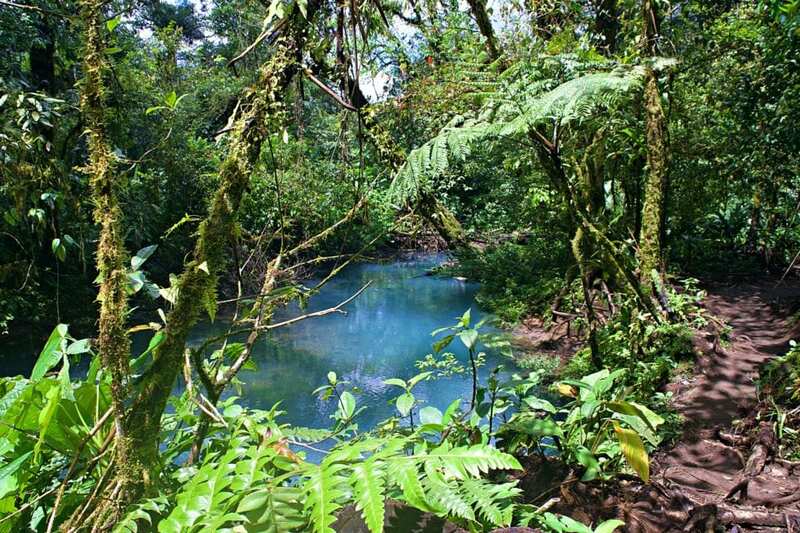 The legend goes that as God was painting the world, he dipped his paintbrush into the Rio Celeste as he was painting the sky and that is why the water is so blue. The blue really comes from silicate suspended in the stream scatter the blue light as it enters the water. In this way, the coloration is more similar to Yellowstone Hot Springs than the heavy calcium in the waters of Havasu Falls. Science and creation mythology aside, Rio Celeste is absolutely stunning. It’s located in Tenorio Volcano National Park. The main waterfall is about a mile hike down a muddy trail with 500’ of stair at the end. In reality, the mud is more of an obstacle than the distance or the stairs. The trail continues past waterfall (with even more mud) to give you access to the Laguna Azul (blue lagoon), Borbollones (hot springs), Tenideros (mixing point). The Tenideros the end of the trail where two streams mix together and first color the water blue. In total, it’s about a 3.7-mile round trip to the parking area to the end of the trail and back – with a lot of mud! As of March 2018, the road is now paved all the way to the Rio Celeste parking lot, which should bring even more tourists and create even more mud. Luckily, you can rent mud boots at the entrance, but you might want to bring a hiking stick and most certainly a change of clothes. There some showers at the entrance but the water pressure is light and there are not enough stations for a heavily trafficked day. Also, you should note that swimming is prohibited at all times inside of the park. 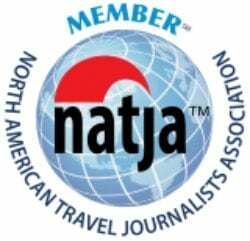 There was a cumulative effect of all of these adventures in all of the participants. Our group grew tighter and friendlier as we each shared each experience. Because each piece was modular, everybody could pick their level of adventure. The adrenaline junkies found a solid fix and the newbies found ways to expand their comfort zone. No single trip was too formidable, but a lot of people enjoyed the hot springs and massages back at the resort. 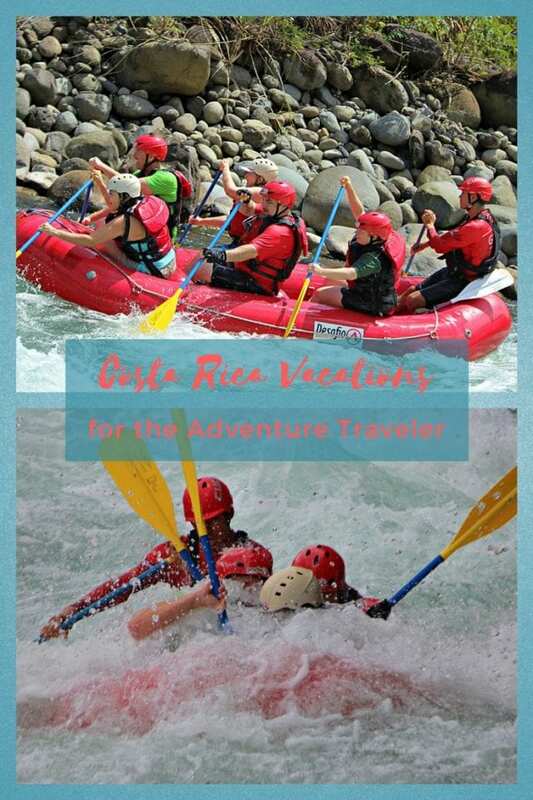 In many ways, the real magic of these adventures was like the waters blending at Rio Celeste. As soon as everything mixes together, magic starts to happen. Pura Vida.